No specials at this time. Please check back soon. Treat yourself to a Best Escape Massage. You will be glad you did! 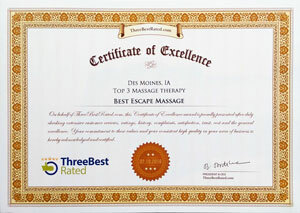 Customer Comments "Rodney at Best Escape Massage is HANDS DOWN the best massage therapist I've seen. Schedules are flexible and prices are competitive. I have chronic pain in my neck and shoulders and never feel better than I do getting off of his table. I would recommend him to anyone!"